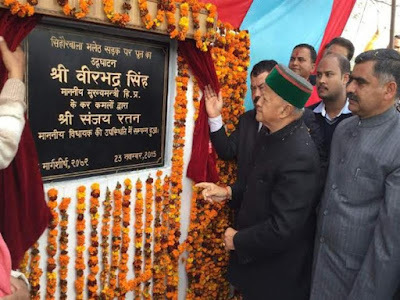 Kangra : Himachal Pradesh Chief Minister Virbhadra Singh today dedicated a bridge over the Beas river at Sihorbala in Kangra district to the people of the area constructed with an outlay of Rs 10 crore connecting both Hamirpur and Kangra districts. It will benefit 36 villages having population of as many as 9000, of both Sujanpur and Jawalaji assembly segments. Earlier, the Chief Minister was accorded warm welcome on reaching Sujanpur Tihra by the local people. While addressing a public meeting at Sihorbala, the Chief Minister said that since the formation of the state, there were merely 300 kilometres of roads length in the state and as of now there were around 34000 kilometres of roads in Himachal Pradesh besides National Highways. With the construction of this bridge, a long pending dream of the people of the area was fulfilled. He said that adequate compensation would be provided to the people who had donated land for the Bridge. He said that it was the Congress government which had given approval for the construction of the bridge and also stressed for making it double-lane at that time, however the design may have been changed during the change in governments. The Chief Minister announced upgradation of the Chowki-Sihorbala Primary School to Government Middle School and directed the PWD to set up rope bridge at Bulli -Sulli village. He advised the people to elect the representatives of Panchayati Raj Institutions unanimously and elected representative should work dedicatedly for the development of the area. The Chief Minister also honoured the villagers who donated their land to pave the way for construction of a bridge. He also flagged off the bus which will ply from Sujanpur to Dehra covering the Changer sector of Jawalaji Constituency.